In a perfect world, financial markets are by design a discounting mechanism of a cash flow stream, risk versus reward, and a psychological environment where the difference between profits and losses is merely perception. In the end, trading is all about the mastery of risk mitigation and leveraging probability. I am an options trader, not because I do not like equities or futures, but because I fear the perception of their so-called safety. Most academics and the average investor believe that financial markets, specifically individual stocks follow a Gaussian, or log normal distribution. While various economists and statisticians have argued this point for decades, to understand that price distributions are in fact not strictly Gaussian. Price distributions are capable of exhibiting more than the predicted occasions of price inhabiting the extreme regions of the distribution curve. Understanding these concepts is critical in order to have a robust understanding of risk. This type of phenomenon is called “fat tail” risk; statisticians refer to it as leptokurtosis. It is this degree of risk well beyond the normally distributed range to which Taleb has characterized as “Black Swan” risk. In financial markets, having accepted that these fat tails do in fact exist and exist with a frequency far beyond what is intuitively apparent, risk becomes significantly harder to quantify. When risk becomes more difficult to quantify it can be said that investors and traders have significantly more exposure to a catastrophic event than they realize. In basic terms, the financial world we live in today is wrought with fat tails. Government integration and manipulation of financial markets, the Federal Reserve’s (supposedly independent) direct engagement into the bond market, and specifically treasuries and mortgage backed securities creates an environment in those markets where distributions are not statistically normalized. Geopolitical risk such as the potential for an Israeli air strike against Iran places unconditional risk on a variety of risk assets, at the forefront light sweet crude oil. If one considers all the various risks extant, risk today seems excruciatingly high. Professors on Minyanville have recently called into question whether paper assets like the Gold ETF GLD is accurately priced. It is widely believed that there is significantly less physical gold versus gold-backed paper. This adds yet another element of uncertainty to an increasingly uncertain environment. What would happen to the gold ETF GLD if an analyst announced that the GLD ETF no longer had access to physical gold? What would happen to the valuation? How can they maintain adequate capital levels inside the ETF if gold demand rises while physical supply diminishes? The answer is contraction in the NAV price of the gold ETF. In real terms, the ETF owns less gold than the paper supposedly represents and price must come down to indicate this discrepancy. Make no mistake, the market will be happy to provide the swift and unforgiving necessity of adjusting to parity. A scenario similar to the condition in which we find financial markets today could likely be summarized as a period of time where Leptokurtosis has become prevalent. 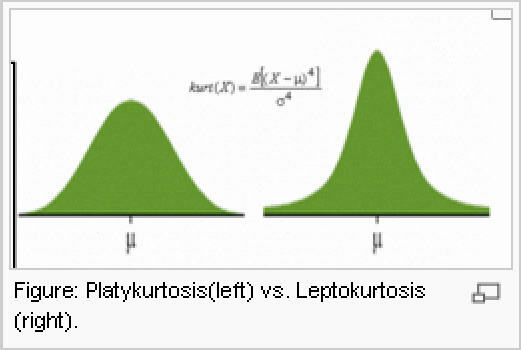 Leptokurtosis is a statistical phenomenon where a population’s distribution, in our case equities, has a rather pronounced peak around the average. This peak is representative of a population that is rife with fat tails, higher variance, and a propensity for abnormally large swings in the standard deviation of returns. What does all this mumbo jumbo mean? It means that when fat tails are present within a leptokurtic distribution, risk literally can become infinite. Fat tails and leptokurtosis are just a few of the many statistical economic studies that have caught the eye of many academics, specifically in the areas of advanced statistics, mathematics, and . . . economics. Distributions, kurtosis, and fat tails are the science behind behavioral finance. To most people this subject matter is boring, however it is only boring if you have never experienced the gut wrenching expression of these phenomena in the market; after that experience, the subject becomes transfixing. The average investor believes that when they buy a stock the likelihood of it declining significantly in a short period of time is relatively minimal. We have been conditioned by Wall Street snake oil salesmen that due to inflationary pressure, over long periods of time equities must rise as a function of inflation. Everything is a buy in the long term, plus it makes for a great story to build a business model around that the retail crowd buys into. While this may be true in the long run, we live finite lives which do not have the luxury of allowing behavioral mean reversion over geological periods of time. Right now risk is excruciatingly high. We have a variety of risks and uncertainties that are plaguing financial markets. The statistics behind the market today would likely exemplify the excessive risk built into the current system. So how exactly does this relate to options you might be wondering? I trade options instead of individual stocks to reduce risk. Options offer a variety of ways to hedge risk, even after a trade has been initiated. Options allow for manipulation where as with stocks and futures there is little one can do besides fully hedge a position. The reason I utilize options instead of futures or equities for swing trades is because by definition they are insulated from outlying events such as an unexpected act of war or a natural disaster which could interrupt the flow of commerce for an extended period of time. Options are inherently less risky than stocks because of the leverage built into them. Since all moneys invested in the market are subject to Black Swan risk, the ability to control an equivalent position with dramatically less capital commitment is a core risk reduction strategy. Yes, a trader can lose his/her entire investment if they own an option naked. Experienced option traders that buy and sell calls or puts naked and then hold them for extended periods of time is likely an anomaly. Experienced option traders will use some form of a spread to mitigate their risk further. Additionally, most online brokers offer option traders access to contingent stops which are based on the underlying asset’s intraday price. Fat tails and leptokurtosis are the result of financial markets reacting violently to unexpected events, similar to what happened this week when the jobs number was much worse than expected or to the still unknown factors which precipitated the recent “flash crash”. Large price swings similar to what we have seen recently are usually attributed to higher volatility. Higher volatility for prolonged periods of time is just another symptom that points to fatter tails and leptokurtic distributions. Reliance on the Gaussian, log normal distributions likely have some of the “machines” on Wall Street in a situation where their models do not work. Option traders leaning long into the close on Wednesday that utilized specific types of spreads had limited risk. They did not have to worry if the market gapped their stop. Their risk was limited from the moment they initiated the trade. In contrast, an equity trader that went long before the close on Wednesday could have exited if they had access to the premarket, however if they didn’t the gap down found them losing more than they originally set out to lose. The market gapped over their stop, leaving them vulnerable to further downside. The unquestioning reliance on stops to close positions in times of Black Swan events is flawed at its core because it denies the very existence of unknown and unknowable risk. This is just one example of how equity traders who routinely hold positions overnight are exposing themselves to potentially unidentifiable levels of risk in today’s market. If we are in a period where leptokurtosis and subsequent fat tails in the distribution prevail nothing is impossible when risk is being calculated. By statistical definition, a period where a fat tail(s) exist indicates a period where risk is extremely high. Log normal modeling software will significantly underestimate the true risk in financial markets. What trading software and price models are you using in your analysis? If you are using a gut feel or one type of stock chart to help guide your decisions about risk, you could potentially be mischaracterizing risk by as much as 5-7 standard deviations. 5-7 standard deviations is scary my friend, the kind of scary that days that have nicknames that start with “black” are made of.